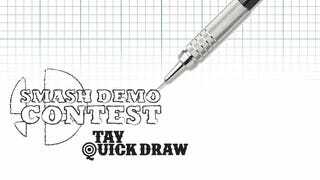 Time for the triumphant return of the TAY Sunday Quick Draw! This week it's actually a contest! Yesterday PSWii2008 was kind enough to give me some Smash demo codes and I'm paying the kindness forward. There are two codes to be had, and in order to win you have to draw and post your entry. After people vote for their favorite I will give codes to the two most starred entries. Hopefully we have a lot of great drawings posted. As always, try to tell a story with your entry, always trust your force, take chances, make mistakes! We're playing it fast and loose with the rules so try and abide by the honor system. Post your work below, then vote for your favorite! Vote for as many as you'd like! At 5PM this afternoon I'll tally the votes and send the codes to both of the winners! Edit: And it's over, congrats to our winners Nach and Josay!